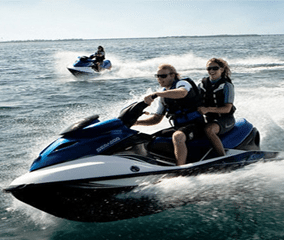 Our first class Muskoka Boat Rental services include free delivery of our boats & Sea Doo rentals, delivered directly to your lake. 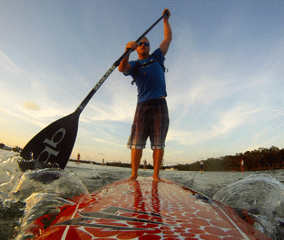 Our Muskoka Boat Rentals are available in Gravenhurst ,Bala, Bracebridge, & Port Carling. 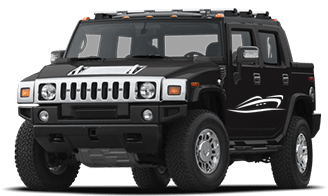 Free delivery for Lake Muskoka Boat Rentals, Lake Joseph Boat Rentals & Lake Rosseau Boat Rentals. 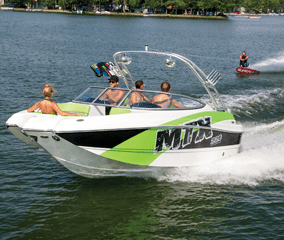 Boasting over 70 Muskoka Boats & Jet Ski’s for rent with more than 25 different models to choose from, NLM has Ontario’s largest boat rental fleet. Made up of premium models, all are thoroughly inspected & meticulously maintained, with our sole focus to allow you to relax & enjoy your Muskoka vacation. Reserve Today! We Book Up Fast! In the 15 years of providing boat rentals on lakes throughout Muskoka, NLM has taken its role in contributing to your vacation very seriously. We go to great lengths to make sure you leave Muskoka satisfied. 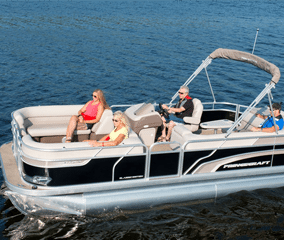 Our Premium Muskoka Boat Rentals are delivered on time & directly to your lake. Boat Rentals on Lake Muskoka, Lake Joseph, Lake Rosseau, Lake of Bays, Kahshe Lake, Lake Vernon, Skeleton Lake. I've been renting from Northern Lakes for about 6 years. The boats have always been great but the key is the service from Ryan and his staff. I've never had a problem and the service has always been impeccable! I have been renting from Ryan for around 15 years and have been very pleased. The boat has been waiting for me at the dock when it is supposed to be with the toys I have asked for (tubes and ski’s). the boats have always been in good working condition. They are a good company and I have not had any issues with them. Always a good running boat. There are around 15 of us that meet at the cottage every year in August. 10 of those are teenagers. If my boat broke down they would shoot me. No holes yet. "I have been providing luxury cottage rentals in Muskoka for the past 8 years… My guests have repeatedly used the services of Northern Lakes Marine. I have greatly appreciated their service as I strive to ensure that my guests have a trouble-free enjoyable vacation. They have lived up to their great reputation with high level service and a great fleet of watercrafts!" "My family has rented personal watercraft over the last 10 years from a number of different marinas throughout Muskoka. Unfortunately, we had a wide variety of issues with all of them: over promising, under delivering, renting unreliable boats and charging insane prices. From our perspective, no other marina compares to Northern Lakes Marine. Ryan differentiates himself and his business by being authentic, polite, courteous, responsive and very accommodating. Ryan’s commitment to his customers has enabled him to build a very loyal customer following. We strongly recommend that the next time you’re in Muskoka during the summer months and need reliable and safe personal water for family enjoyment – give NLM a call!." "I have rented boats and jet skis from Northern Lakes Marine each summer for the past five years. My experience has been terrific. The equipment is always in great condition and the prices have been very competitive. Ryan and his team are reliable, responsive and a pleasure to deal with. I highly recommend Northern Lakes Marine if you are considering a rental"
"Ryan’s customer service and professional integrity exceeded our expections. His ability to react in a challenging circumstance was greatly appreciated. We would not hesitate to use his services again, and highly recommend Northern Lakes Marine. Top qualities: On Time, High Integrity, Creative." "This company absolutely rocks! 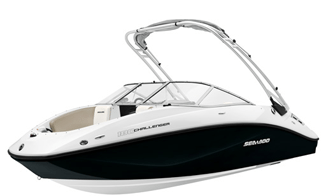 Rented the 18′ Sea Doo Challenger for 5 days in July 2011. The rental made the week an amazing experience. The person I dealt with at NLM was Ryan (awesome awesome) and he totally was accomidating to every request. Even said he could meet us with the boat at any boat launch we wanted! Here is the best though – when it came time to return the boat, I told him I would meet him at a different boat launch (it was closer to our cottage) and instead of somebody picking me up at the launch…HE DROPPED ME OFF HIMSELF RIGHT TO MY DOCK WITH THE BOAT!! Total professionals that understand customer service! Definitely renting again!!!" We just returned from our weeks vacation on Muskoka Bay and we rented a Sea Doo from you for 2 days. We just wanted to thank you as we had a blast using it.We hope to be up there next year and we will certainly be looking you up again. Have a great day! Proudly servicing Muskoka with Ontario's largest fleet of Muskoka Boat Rentals since 2002. 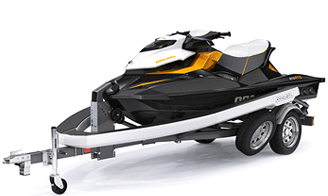 NLM provides Premium Boats & Sea-Doo's for rent along with a customer first ideology & turn key service built just for you. Our Muskoka Boat Rentals include Free Delivery to your location because it's your vacation and we want you to enjoy every minute of it! Reservations for this years boating season has already begun, do not wait! We book up fast! ©2019 All Rights Reserved. Powered by Northern Lakes Marine.